This preview is based on a print and play version of the game provided by the designer. This might not be the final version of the game as there may be rule changes before the final version of the game. 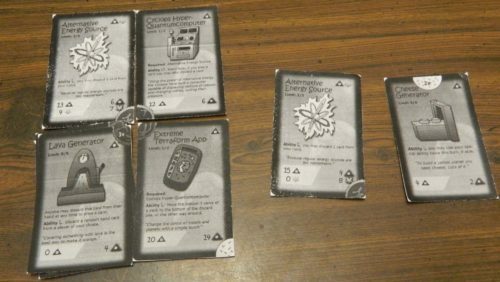 The pictures in the how to play section are in black and white because I don’t have a color printer but the cards are actually in color. Each player chooses one of the character cards and places it face up on the table. Give the prophecy card to the player who is playing as the prophet. Shuffle the alignment cards and give one to each player. The alignment cards not used are removed from the game without any players looking at them. Players look at their alignment cards and keep their alignment secret for the rest of the game. The Cyclops and Prophet players received the destroyer allegiance and the Catnian and Shapeshifter received the protector allegiance. Shuffle the rest of the cards and give seven to each player. Divide the rest of the cards into two equal draw piles. Whoever is playing as the Catnian gets to start the game. The objective in Apocalypse Frenzy is to score the most points. Players can score points in a couple different ways. Main Mission (30 Points): Each player has a main mission which is dependent on a player’s character and their alignment. 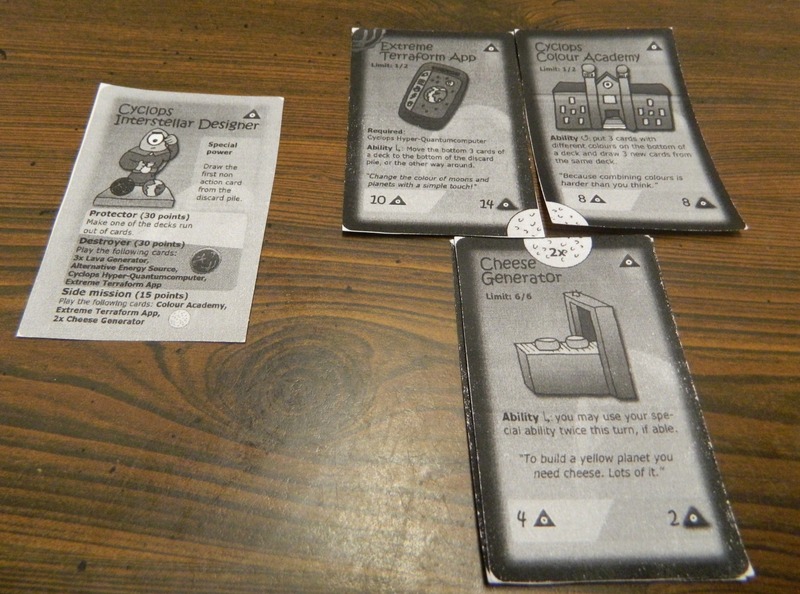 If a player has the protector alignment, their main mission is to make one of the two decks run out of cards. If one of the two decks run out of cards, all of the protector players receive 30 points. One of the two draw decks have been depleted. The protector players completed their main mission. Cyclops and Catnian: Play the required cards in order to destroy the Earth. The Cyclops player successfully completed their destroyer main mission by playing the required cards. Prophet: Give the prophecy card to the player who you think will destroy the world. Shapeshifter: Play eight cards in front of yourself. Side Mission (15 Points): Each player has a side mission which is dependent on a player’s character card. Cyclops, Shapeshifter: Play a certain set of cards. The Cyclops player has completed their side quest by playing the required cards in front of them. Catnian: Play the “Harry, the first Catnian” card. Prophet: Give the prophecy card to a player that has the destroyer alignment. Playing Cards For Their Value: Players can play cards in front of themselves that are worth points. These cards have two numbers along the bottom of the cards. The number on the left says how much the player scores from the card if they are a protector. The number on the right says how much the player scores from the card if they are a destroyer. 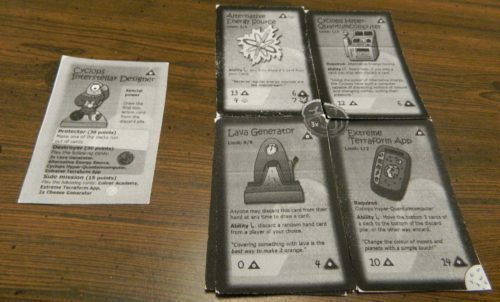 The Cyclops player (top symbol) will score fifteen points from this card if they are a protector and they will score four points if they are a destroyer. The Prophet player (bottom symbol) would score zero points if they are a protector and they would score eight points if they are a destroyer. On a player’s turn they have the option to perform several different actions. The actions may be performed in any order but each action may only be performed once per turn. Once a player has finished their turn, the player must draw or discard cards until they have seven cards in their hand. The card must match the color or symbol of your character card. A player can play multiples of the same card. The left number after the word limit on the card says how many of that type of card that a player can have in front of them. If a card has the word required on it, the card cannot be played until the requirement is met. Use Your Character’s and Card’s Special Abilities: Each character card has a special ability that the player can use once per turn. Players can also use abilities from cards played in front of them that can be activated every turn. Trading Cards With A Deck: If a player has three cards of the same color that they don’t want they can trade them in for some new cards. The player places the three cards at the bottom of one of the decks and draws the top three cards from that deck. Trading Cards With Another Player: A player can choose to trade any number of their cards for any number of cards from another player. Players can share as much or as little information as they want with the other player. Players are also allowed to lie about what cards they are trading with the other player. The game ends if one of the decks run out of cards or one of the players completed their destroyer main mission. Players count up their points earned and whoever has the most points wins the game. This player was a Cyclops destroyer. The player completed their main mission which earns them 30 points. They also receive 46 points from the cards that they played for a total of 76 points. 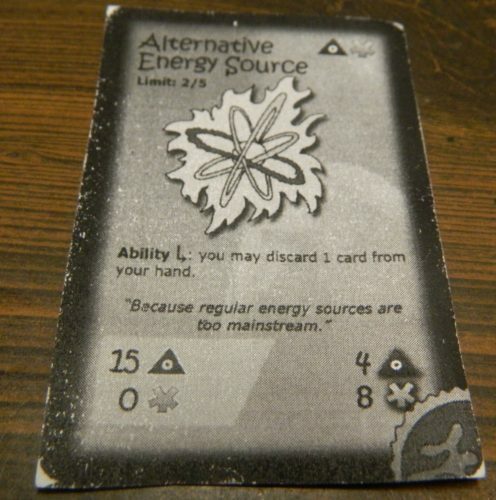 The one thing that I found most interesting about Apocalypse Frenzy is the idea that the game takes a traditional card game where you try to get the most points and adds in roles and allegiances. I haven’t seen a lot of games that have combined both types of mechanics.While Apocalypse Frenzy is not a perfect game, it has some interesting ideas that show potential. I like the basic premise of the game of adding roles and allegiances to a more traditional card game. I like this combination of mechanics since while card draw luck is really important (you won’t win with terrible luck), you have options to score points. Don’t get the cards you need to complete one of your missions? You could instead play a bunch of cards that give you a lot of points. While players that complete their missions have an advantage in the game I can actually see a player winning the game without completing both of their missions. There is even a slim chance of winning without completing either of your missions. I say this because in one game I was unable to complete either of my missions and I actually didn’t lose by that much. As a whole I would say that Apocalypse Frenzy is a light to moderate card game. The game takes a little while to fully understand but once you understand the game it is quite easy to play. I give the game a lot of credit for making the game as easy as possible to play. For the missions that require a player to play certain cards, the necessary cards have symbols printed on the sides of them that create a picture when you play them next to one another. You can then just look for those symbols on the sides of the cards to see which cards you still need to complete the mission. For the most part I liked the idea of the characters. The characters have some interesting special abilities and I think it is interesting that all of the players aren’t trying to do the same thing in the game. I don’t think all of the characters are created equally but they are unique enough that the game does feel different playing as the different characters. The problem with the characters is that I think it is easier to play as some characters than it is to play as other characters. The biggest problems are with the Prophet. I don’t really like the Prophet character since it seems easier to score points with the Prophet and it is just kind of boring playing as the Prophet. Since the Prophet’s missions are based off of other player’s actions, the Prophet really doesn’t have any missions to complete. Basically all the Prophet can do during their turn is play cards that help themselves score points and try to lead the other players into destroying or protecting the planet (whichever is the Prophet’s objective). The Prophet’s missions aren’t that difficult unless the other players are really good at hiding their intentions. The side mission in particular is really easy since one of the destroyers are likely to tip their allegiance at some point so the Prophet will know who to give the Prophecy card to. I found the trading mechanics to be interesting. I think it is interesting that there are next to no rules regarding trading with the other players. Basically you can make any type of trade and you can even lie to the other player by not trading them the card(s) you promised to trade them. I found this to be interesting since you can strategically choose when to lie to other players to get cards that you need. Don’t lie too often though or players won’t trade with you anymore. The problem with the trading is that it just doesn’t happen as often as you would like. It is harder than you would think to trade with the deck since it is hard to get three cards of the same color which aren’t cards that you could use. It is also surprisingly hard to make trades with other players. The problem is that you really can’t trust what the other players are going to give you and it is hard to get two players that have cards that the other player wants. At this point the biggest issue I had with Apocalypse Frenzy was that it seems much easier to play as a protector than it is to play as a destroyer. I think it is much easier for a couple reasons. First the protectors will automatically win at some point unless one of the destroyers are lucky enough to destroy the planet first. The problem is that it is quite hard for the characters to fulfill their destroyer missions. The Catnian and Cyclops need a lot of specific cards in order to complete their missions which requires a lot of luck. The Prophet can’t even destroy the planet themselves and must work with the other destroyers. Finally the Shapeshifter has a lot of restrictions on what cards it can play which limits how fast they can reach eight cards to destroy the planet. Second the protectors have the benefit of being able to work together. Early in the game the protectors won’t know who the other protectors are but these players are indirectly working together because all protectors should continue to take cards from the deck that has less cards. I don’t really even see much of a reason to hide that you are a protector since the destroyers really can’t do anything to stop the protectors other than refusing to trade cards with them. Basically the protectors can just continue taking cards from the draw piles even if it reveals their allegiance. I don’t know if it is that important hiding your allegiance from the other players. You don’t really want the Prophet to figure out who the destroyers are since it gives the Prophet player points. If players found out your allegiance they also might not be willing to trade you a card that would help you based on your allegiance. Players wouldn’t likely trade you these cards anyway though. Eventually everyone will have to reveal their allegiance since towards the end of the game you have to make some moves that will tip your allegiance. I personally would recommend somewhat skewing the allegiance cards you pick from at the beginning of the game in order to prevent unfair teams. If you would ever get a game where there are three protectors and only one destroyer, I can’t ever see the destroyer completing their main mission. I personally would always make it that at least half of the players are destroyers since I don’t see the destroyers winning very often unless there are at least as many destroyers as there are protectors. If a protector is outnumbered I think they still have a chance at winning the game but I don’t think the opposite is possible. Apocalypse Frenzy is not a perfect game but it has some good ideas. I like the premise behind the game. I like the fact that the game combines elements from traditional card games with roles and allegiances. I had fun with the game. Apocalypse Frenzy relies a lot on luck and the characters and allegiances don’t seem to be fully balanced yet. The game’s basics are solid though and with some small tweaks I think Apocolypse Frenzy could be a good card game. If Apocalypse Frenzy’s premise sounds interesting to you, you should look into the game. To find out more about the game check out Apocalypse Frenzy’s Official Website. If you are interested in checking out the game’s Kickstarter campaign you can check it out here. A pledge of $21 or more will get you a copy of the game. The Kickstarter campaign runs until December 1st, 2016. An interesting combination of a typical card game with different roles and allegiances. Some of the roles are better than others. It is easier being a protector than a destroyer.